My mom’s dementia is without a doubt one of the most difficult things I’ve ever endured. People call it “the long goodbye” and it’s excruciating to watch someone you love literally fade away in front of you, often battling an opponent they cannot understand or even see. It’s like watching someone gasping for breath as their lungs empty – the fear in their eyes and their struggle to remember is chilling. To survive that season and to be able to care for my mom each and every day, I had to find some meaning in it all. I clung to the funny moments and I hope that I will be a better, more compassionate person because of the experience. 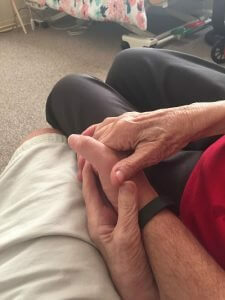 One of the most profound lessons I’ve learned through her dementia is the power of a simple act; the act of reaching out and holding someone’s hand. My mom’s disease was at a stage where two-way communication was difficult. She was still very verbal but only about half of her words actually make any sense. The stories she told with conviction were fiction and often the words she used sounded sort of like English but are the same babbling that a toddler might use to mimic speech. But when she was scared, lonely, or angry – the one thing I could still do to break through the fog was to just hold her hand. There are days when I would sit next to her for a couple of hours and hold her hand. She would cling to it, squeezing it tightly now and then. She would doze off and even in her sleep; tighten her grip if she thought I was pulling away. I’ve always been a physical person. Maybe it’s my Italian blood. I am quick to hug or wrap my arm around someone. But I’ve come to see that there is no more intimate touch or connection holding someone’s hand. There’s nothing in it for the giver. It’s not the opening act to some other kind of touch like a kiss can be. It’s not fleeting like a hug (although I love those too) or awkward in public. Holding someone’s hand says everything we need to say. I was in a restaurant with a friend, trying to talk about what was going on with my mom and I got choked up. She reached over and put her hand on top of mine while I struggled to regain my composure. She didn’t say a word. But she said everything I needed at that moment. There’s no relationship that has more physical contact than a marriage. Each touch had an intimacy to it, but even when we couldn’t find the words to talk about an issue or when one of us just needed some reassurance – we could and would hold hands. When my daughter was little, if she was scared, worried or felt exposed, she would reach for my hand. I was safety. I was comfort. And when she had my hand, she knew that I wasn’t going to let anything bad happen or if it did, I would shield her from it. Whether we were walking through Walt Disney World or watching a scary movie, I loved the feel of her little hand in mine. I didn’t have to say a word…she knew. During my mom’s final days, she got less and less verbal and for her last 72 hours, she didn’t get out of bed. I just sat next to her and held her hand. For awhile she was able to give my hand a squeeze as I talked to her, played her favorite music and said everything that needed saying. But towards the end, she was too weak. I held her hand until her dying breath and for about 15 minutes after she was gone. We’d get through the end together.